Today marks the official launch of LSE Press, the School’s new open access publishing platform. LSE Press will provide a platform for high-quality research in the social sciences, and – in line with LSE’s aim to lead in international, interdisciplinary, issue-oriented social science – will support the launch and development of academic-led publications that are innovative in their format, content, and reach. The Press platform is provided in partnership with Ubiquity Press. Speaking ahead of the launch event later today, LSE’s Pro Director for Research, Professor Julia Black said: “We’re really excited to launch this new platform to publish high-quality social science research. The LSE Press has arrived at an important time for academic publishing, as the open access policy landscape shifts to include books as well as journal articles. Support for our authors has been a priority for the LSE Library for a number of years, and the Press will improve the publishing options available to social scientists”. LSE Press is just the latest in a succession of new university press initiatives. UCL Press, the UK’s first fully open access university press, has published a strong programme of monographs and edited collections since starting in 2015, and earlier this year announced plans to launch its own megajournal. Others, such as the University of Huddersfield Press, established in 2010, have been publishing a little longer, while more recently launched examples include Goldsmiths Press and White Rose University Press, a cooperative endeavour run jointly by the Universities of Leeds, Sheffield and York. The progress of this “new wave” of university presses and library publishing ventures was charted by Janneke Adema and Graham Stone in last year’s Jisc report, “Changing publishing ecologies: A landscape study of new university presses and academic-led publishing”. What many of these new presses have in common is that they are open access, library-based, and “often offer a smaller set of services than a traditional publisher, blurring the line between publisher and platform”. Indeed, dissatisfaction with traditional academic publishing has been a significant motivating factor in the emergence of so many new university presses. The scientific publishing industry has been increasingly consolidated among a handful of large companies, which continue to report huge profits each year. The Jisc report highlighted university presses’ general frustration with this commercialisation of scholarship and an ambition to provide a genuine alternative to the existing legacy model. The new university press model is intended to work for its research communities first and foremost, and in doing so provides opportunities for a university to showcase its own academics’ work. LSE Press launches with its first publication, the Journal of Illicit Economies and Development, led by researchers in the School’s International Drugs Policy Unit. This new title will offer research and policy commentary on the complex relationship between illicit markets and development. For Editor-in-Chief Dr John Collins, publishing open access was a key part of his vision for the journal’s success: “This new journal, the first of its kind globally, will go a long way towards disseminating the complex research and policy evaluation needed for policymakers and civil society going forward. 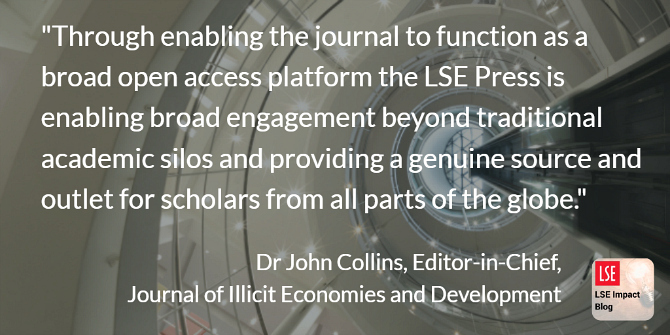 Further, through enabling the journal to function as a broad open access platform the LSE Press is enabling broad engagement beyond traditional academic silos and providing a genuine source and outlet for scholars from all parts of the globe”. The first volume of the new journal will be funded by the School, with authors not required to pay article processing charges during this initial 12-month period. LSE is exploring funding models and has made funds available to support new publications during the start-up phase. It is an aim of LSE Press to make open access publishing a sustainable option for the social sciences. In addition to journals, LSE Press intends to publish a range of book publications, including more traditional research monographs, short-form monographs, and even textbooks. Again, offering authors viable open access routes to publication is of increased importance here, in response to a changing policy environment and the announcement by HEFCE – now Research England – that future Research Excellence Framework assessments will extend open access requirements to include books as well as journals. The new university press model also offers the opportunity to pursue more innovative publications and experiment with new types of content. In this spirit, LSE Press will explore options for more specialised digital publications, such as data or coding journals. Opportunities will be extended beyond the faculty, with the possibility of student journals also being hosted on the platform. All proposals are welcome – including from outside of LSE – and will be considered by the School’s Research Committee, as well as a newly formed advisory board, comprised of representatives both from across LSE and external publishing professionals and which will provide guidance on publications and the future direction of LSE Press. For further information please visit the LSE Press website. You can also follow LSE Press on Twitter @LSEPress or get in touch by email: LSE.Publishing@lse.ac.uk. Kieran Booluck is editor of the LSE Impact Blog. He has a background in higher education and academic publishing, having worked in a variety of editorial roles. His interests are in notions of impact, the REF, public engagement initiatives, and scholarly communications.